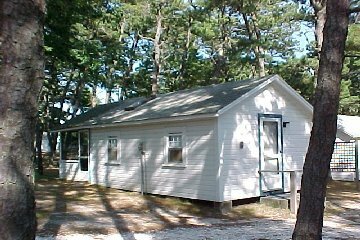 This lovely, 2-bedroom cabin is located just minutes away from the best beaches the town of Wellfleet has to offer. Only one mile from Cape Cod National Seashore and Cape Cod bike trail. A five minute drive to any one of the spectacular Wellfleet ocean side beaches - Cahoon Hollow, LeCount Hollow, Newcomb Hollow, or White Crest. Full eat-in kitchen including table, pots, pans, and all utensils. For those rainy days, or to help put the kids to rest at night, full cable (Nickelodeon), VCR, and DVD. Picnic table and gas grill. Master bedroom has a double bed, second bedroom/living space has two twin beds. Screened in porch. 2. Renter must provide bed linens, bath and kitchen towels, and propane gas for grill (refill station just down street). A few good weeks in July and August still available! Copyright©2009 Brownies Cabin Condominium Trust, All rights reserved.